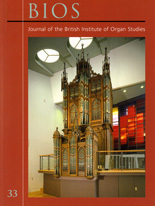 The British Institute of Organ Studies (BIOS) encourages and promotes the study of the pipe organ, including the history and design of the instrument and its music. It owns the National Pipe Organ Register and is the listing body for historic organs. BIOS is effectively the amenity society for the British organ. It lobbies Government, Historic England and other national bodies on behalf of the instrument. BIOS is a registered charity No. 283936. 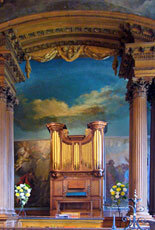 A Video Guide to the Organ was recorded at Holbrook School by Tom Bell and Richard Brasier. CLICK HERE to visit. A revised edition of the BIOS advice note Sound Advice - The Care of your Organ has been issued. CLICK HERE to download. Peter Hurford, noted organist and Founder of the St Albans International Organ Festival, died on Sunday 3rd March. There is a brief obituary on the www.organroxx.com website. 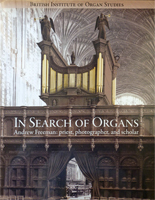 The Andrew Freeman book In Search of Organs is now published. Edited by Katharine Pardee. Hardback 308 pages 234 full-page organ case photographs. Shop price 40 pounds BIOS website price 35 pounds. CLICK HERE to buy. Individual photographs can be accessed from this website (CLICK HERE) or from the National Pipe Organ Register. The Historic Organs at Risk Register singles out important organs under threat. For more information CLICK HERE. The Historic Organ Sound Archive now includes some new recordings accessible via YouTube. To access the catalogue CLICK HERE. Organ Music on-line is now available 24/7. Over 111,000 listeners in its first 12 months. Try it at www.orgelradio.eu Thursday is Bach day ! The European Parliament Directive on the use of 'hazardous substances' has been amended to specifically exclude pipe organs from a ban on the use of lead 'due to the lack of alternatives for substitution', 'significant cultural loss' and the potential Europe-wide annual loss of up to 65 million Euros. To promote objective, scholarly, research into the history of the organ and its music in all its aspects, and, in particular, into the organ and its music in Britain. To conserve the sources and materials for the history of the organ in Britain, and to make them accessible to scholars. To work for the preservation, and where necessary, the faithful restoration of historic organs in Britain. To encourage an exchange of scholarship with similar bodies and individuals abroad, and to promote, in Britain, a greater appreciation of historical overseas schools of organ-building. The proposal to create an organisation dedicated to the study, preservation and promotion of the historic British organ arose from discussions between Nicholas Thistlethwaite, Nicholas Plumley and the late Michael Sayer in 1975.